I was in the mood to bake, but not to scoop dozens of cookies. Fortunately, I remembered this random Very Best Baking brochure thing I got in the mail. It has very simple recipes, including this Toll House original which I haven’t made in years. Baking these in a pan, rather than scooping out balls of dough, made this recipe super fast and easy. They’re good cookies, but a little too greasy for my taste. Preheat the oven to 375 degrees F (190 degrees C). Grease a 10×15 inch jelly roll pan. Combine flour, baking soda and salt in small bowl. Beat butter, granulated sugar, brown sugar and vanilla extract in large mixer bowl. Add eggs one at a time, beating well after each addition. Gradually beat in flour mixture. Stir in morsels and nuts. Spread into greased 15 x 10-inch jelly-roll pan. Bake for 20 to 25 minutes in the preheated oven, or until golden brown. Cool in pan on a wire rack, then cut into bars. I do not have (nor do I know exactly what) a jelly-roll pan is, so I used a regular 15 x 9 Pyrex glass baking dish. A jelly roll pan is really just a cookie sheet with sides. 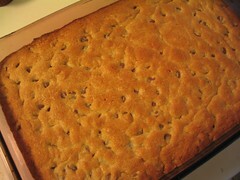 About 1 inch high, most stores just call them cookie sheets, but they are techincally jelly roll pans. I found this out the hard way a while back. I’ve never thought that cookies could be baked this way. I feel like trying it sometime! I used to bake cookies like this all the time. Especially when I’d slowly become less and less ambitious while I was mixing up the dough. They look delicious. The perfect accessory to a cup of tea. I was looking for a sugar cookie recipe and came across yours (long time reader of your blog).. im making them for chanukkah this year.. im curious about the icing… does it set up so it wont smudge if you stack other cookies on it? I looked up alto browns recipe and his glaze is more of a royal icing.. i dont really like the hard crunchyness of that icing on sugar cookies.. so thats my dilemma… suggestions? It does set up, and it does NOT have that horrible royal icing crunch to it. Love your blog! I’ve already linked you to my page! That’s one way to get around all the cookie dough scooping! I’m thinking I should do something similar for the party my 5th graders are having this week. That is way too many cookies for me to scoop! My daughter has made this recipe and I posted photos on my blog and put a link back to your website and recipe, hope you don’t mind?